Besides other indicators, the economic performance of an enterprise can be measured by its value added, i.e. its production value minus the value of intermediate inputs. Or more precisely, an enterprise's value added includes employee compensation, tax payments, interest payments, rental payments as well as owner profits (i.e. national income). It is a pure output measure, and excludes factors such as a consumer's satisfaction with a product. To measure the economic performance of a country, one has to sum up the value added of all domestic enterprises. To calculate a country's gross domestic product (GDP), one takes only domestically produced goods and services into account, subtracting subsidies and adding taxes. The European System of Accounts (ESA) 2010 considers more than just businesses to measure GDP: other productive sectors, such as public administration, unpaid household production (housework, child care, etc.) and parts of the shadow economy, are incorporated as well. The value added of these sectors normally has to be estimated either because activities are not observed, or there is no production value. Sharing for money, or sharing activities that are similar to business-to-consumer activities are relevant to economic performance. For example, Internet platforms such as freelancer.com match workers and enterprises for project-based cooperation. In this case, these projects' value added is measured by GDP. The booking commission that Blablacar takes for car sharing is a part of employee compensation and owner profit. These components of car-sharing activities also find their way into GDP. However, the payment that a non-professional Airbnb host receives from renting out her apartment often cannot be measured by GDP. The act of sharing a couch to provide strangers with free accommodation has no monetary value, and is definitely not contained in today's measure of GDP. Splitting up GDP into individual industries allows us to calculate an estimate of sharing activities in the overall economy. Currently, the industries mainly affected by the sharing economy are trade (retail and wholesale), transportation, and accommodation and food services. Equally affected in the near future could be financial services and various scientific and technical activities. These industries make up about half of GDP in developed countries, with some variation (45 percent in Switzerland, 50 percent in the United States). The impact of sharing per industry relies on two factors: the percentage of people using sharing services, and how much of their total expenditures go to sharing in addition to traditional providers. The percentage of the population engaged in the sharing economy in Switzerland varies between 0 percent and 30 percent depending on the sector, with transportation and accommodation at the top. Their share of wallet going to sharing can be estimated with the share of household expenditures via Internet, ranging from <1 percent for financial services to 14 percent for accommodation. If we multiply these three factors (share of an industry in GDP, share of people engaged in sharing within an industry, and share of wallet of those people), we end up with the impact of sharing on GDP for each industry. 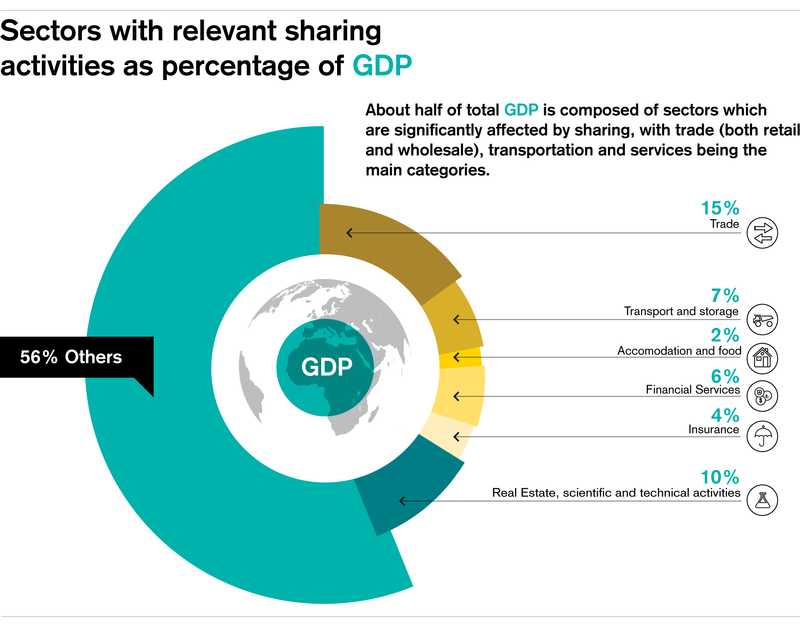 The total GDP impact of the sharing economy is still fairly small at around 0.25 percent of GDP, as either the industries in which sharing is already a sizeable part are rather small (in the case of accommodation), or the industry concerned is large, but sharing is not yet very relevant in it (as is the case of finance and insurance). If we assume that individuals engaged in sharing spend 80 percent of their expenditures on sharing (high scenario), this would rise to around 1 percent of GDP. The bottom-up method focuses on the most affected sectors: finance, services, goods, accommodation and transport as well as music and video streaming. For each sector, the method approximates the share of household expenditure that flows into sharing activities. Thereby, the bottom-up method takes only those expenditures on potential peer-to-peer activities into account. For example, a large part of household spending on financial service activities is in fact payments for housing, water and electricity. These expenditures are excluded from measurement. In the next step, expenditures for intermediate inputs – which are assumed to be the same as those of businesses – are subtracted from the expenditures on sharing. The sum across all households and sectors equals the value added of peer-to-peer commerce. In the high scenario, peer-to-peer commerce as a percentage of household expenditures is approximately 80 percent of the share of sharing households. With this assumption, peer-to-peer commerce in Switzerland generates a value added of roughly 6 billion Swiss francs per year, or 0.95 percent of GDP. In the more conservative scenario, it is assumed that sharing households spend as much a share on peer-to-peer commerce as they spend on online shopping. In this case, the Swiss value added of peer-to-peer commerce is approximately 0.5 billion Swiss francs per year, or 0.1 percent of GDP. Obviously, the two measurement approaches lead to similar results. Moreover, even in the high scenario, the sharing economy adds only little to Swiss GDP, at least today. To date there exists no systematic way to measure the value added of GDP-relevant sharing activities. But these can be reasonably approximated. Our top-down method estimates the impact of sharing for each industry. Conversely, our bottom-up method estimates the impact of sharing as a percentage of household expenditures. In each case, the "normal" scenario assumes that spending on sharing activities equals the amount spent on online shopping. The "high" scenario assumes that 80 percent of expenditures go to sharing activities. 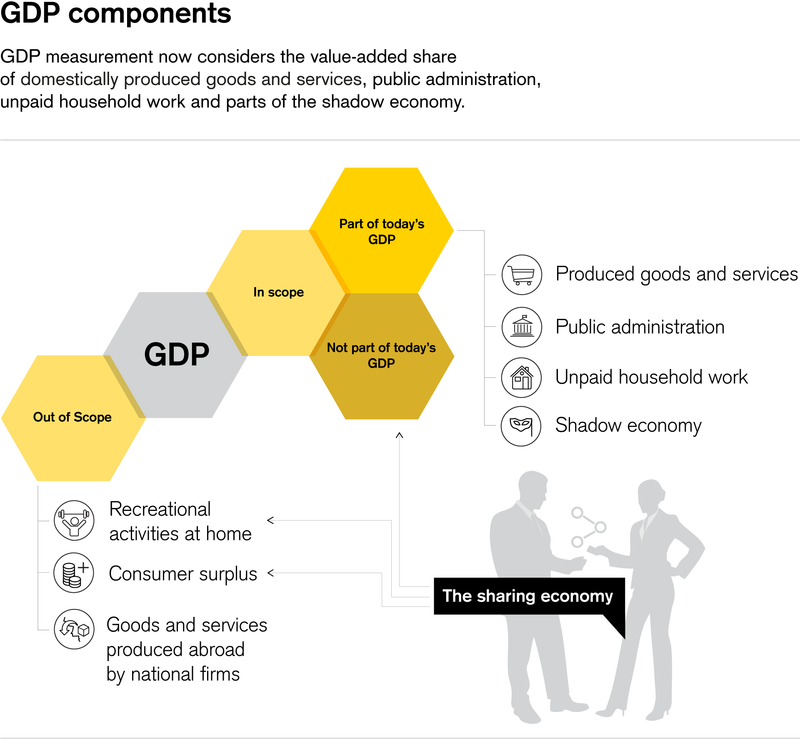 The GDP impact of the sharing economy is of similar size as other activities that cannot be measured exactly, such as other parts of the shadow economy. 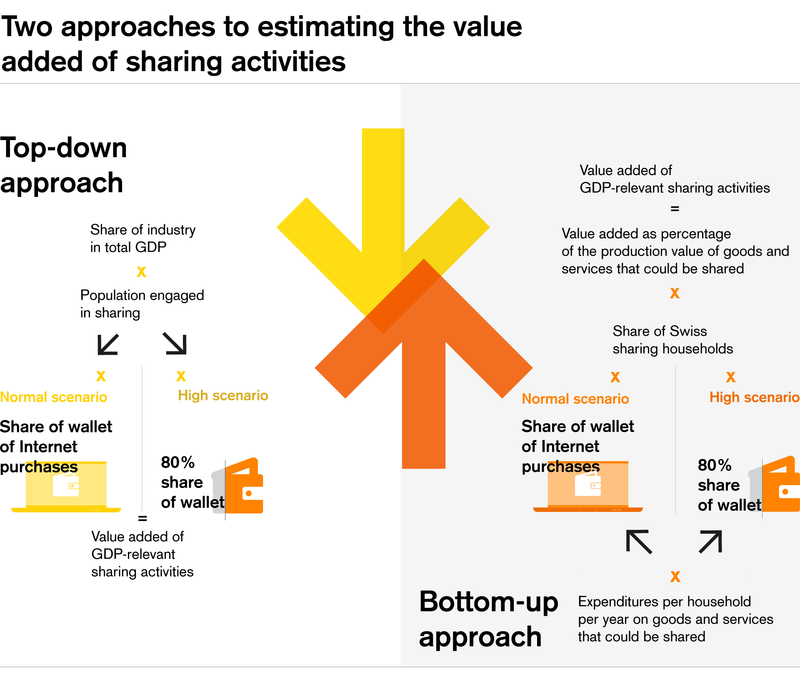 While the overall impact is small, the strong growth of sharing activities suggests GDP growth calculations could be underestimating real growth as activities shift from the traditional sectors to the sharing economy. This shift of activities might be happening on a larger scale, but the net effect remains small. Also, GDP calculations do not capture all beneficial aspects of the sharing economy. But the wide usage of GDP as a measure ranges across many important economic indicators, from sovereign credit ratings to the tax base of a country. If, in the future, sharing activities become more widespread, this shift to less measurable activities will require a new way of looking at GDP. Is active What's the Value Added of the Sharing Economy?